Successfully added DaRT to boot image….or did it? Successfully added DaRT to boot image….or did it? Here is how to identify the problem and a link to fix it! 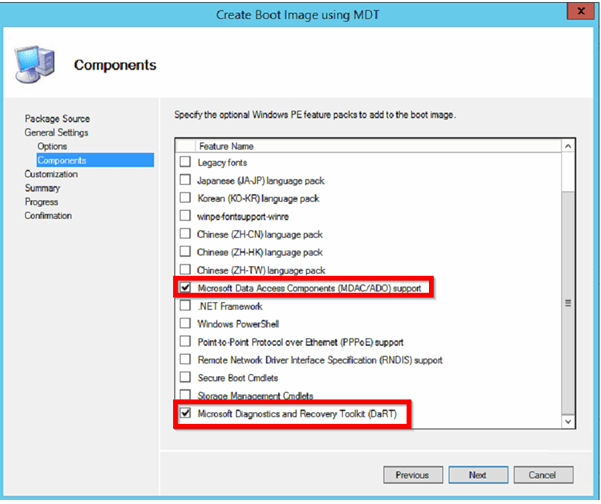 I was recently onsite with a customer where the proposed design document included MDOP DaRT integration into the boot images. 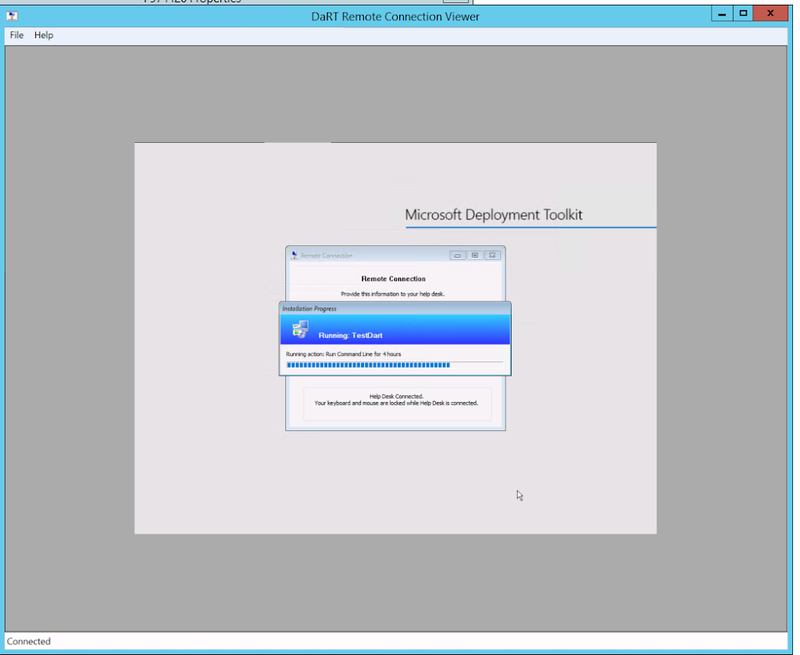 DaRT is a great tool to have because it gives the engineer the ability to remotely connect to the machine while within the WinPe environment. 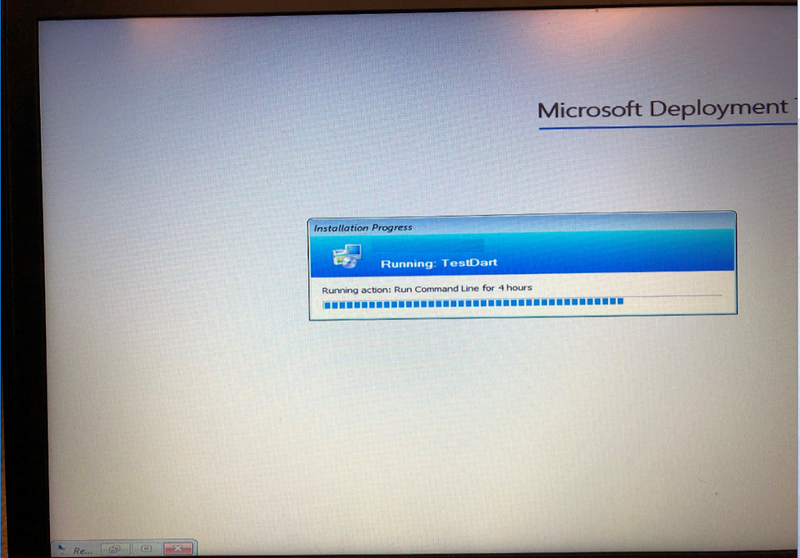 This particular customer is undergoing a massive and understaffed windows 10 migration where every bit of efficiency really makes a difference on deployment nights. 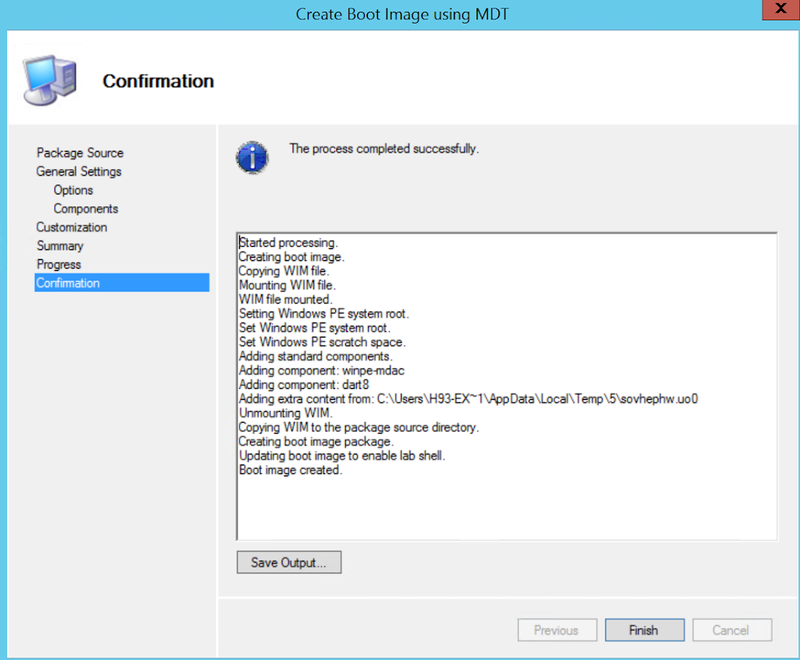 First a quick review on installing MDOP DaRT, Enabling Monitoring, and creating the boot image. Once this is filled you will start to see systems as they image from this view. 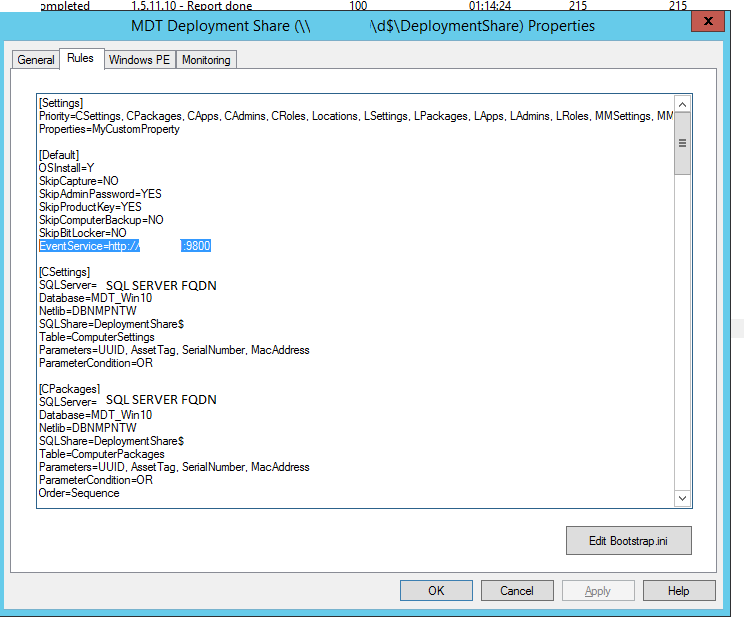 If you are in an environment that is not really using the MDT deployment share you would still open up the MDT toolkit and modify the CustomSettings.INI. 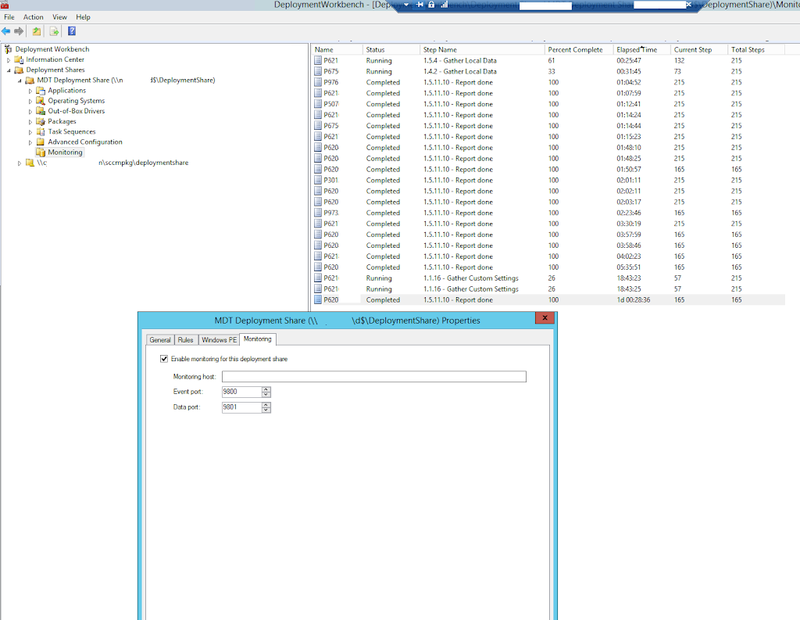 This customer is heavily utilizing the MDT Deployment Share with all the settings applied we can access the “Rules” tab and see the setting is automatically applied after we enabled monitoring. 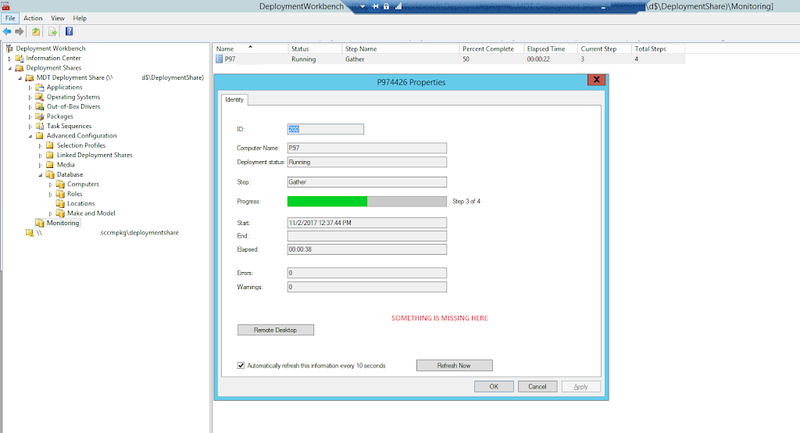 The great part about using the deployment share in this scenario is that we can make constant on demand changes and not have to worry about hash mismatch errors like if were working within the MDT toolkit package. From this point we distributed the enabled the boot image for PXE deployment, added drivers, and attach it to a task sequence. In the screenshot below you will notice we are missing something? We do not have the “DaRT Remote Control” option that we should have. NOTE: Sometimes when the boot image is “Successfully” created it does not add the “DaRT” tool. I am able to verify this to be a LIE by looking into the PEMananger.LOG located in my temp folder. When we look at the command that was ran by accessing the “RunCMD.CMD” we see that only the WinPE-MDAD_EN-US.CAB is the only package even attempted to be added. You can investigate further by opening up DISM GUI and searching for any trace of DaRT on the boot image. As you can see DaRT did not even attempt to be installed into the wim. Manually modify boot image to include Dart functionality by using the script below. HOW TO FIX IT: Johan Arwidmark has a script available online that I have used to inject the Dart into a newly created WIM. Once we ran the script created by Johan and injected the drivers I was able to start using DaRT tools. After the USMT toolkit is called and the Gather step starts to run a box on the bottom left will appear on the system being imaged but minimized. This is your indicator to let you know that you can now use DaRT functionality. Do not always take the console UI at face value and always verify with log files. Some occasions the console indicates something was done correctly but you need to check the logs. If this happens then you need to go old school and use the tried/true methods. If you run into a problem always do a quick search b/c the Deployment Research guys might already have a work-around. To vote for this to be fixed from SCCM team please visit the link below. https://i0.wp.com/sccmf12twice.com/wp-content/uploads/2017/11/1-1.png?fit=1024%2C793&ssl=1 793 1024 chris buck https://sccmf12twice.com/wp-content/uploads/2018/08/SCCM-logo.png chris buck2017-11-11 05:48:002018-12-11 11:34:56Successfully added DaRT to boot image….or did it? Default out-of-the-box booting on WinPE with SCCM 2012/2016 is very slow. In some environments I’ve seen this take 3 hours to download the Boot.Wim. This is because System Center Configuration Manager 2012/2016 uses small TFTP block sizes of 512 bytes. This behavior is set because it’s compatible with all network configurations; but the result is that the PXE boot speed can be very slow using Operating System Deployment with SCCM. To increase the PXE boot speed, we need to modify TFTP Block Size. 16384 is the maximum supported value. If it is bigger, you can have corrupted data. I typically run 16384 and 8182 in my environments. These will be DP that are on server 2008R2 and later. To my knowledge this feature has been built into CB1606 but I have not moved there yet to test myself.